23 cm 288 p. : ill.
Head of the secret police from 1937 to 1938, N. I. Yezhov was a foremost Soviet leader during these years, second in power only to Stalin himself. Under Yezhov's orders, millions of arrests, imprisonments, deportations, and executions were carried out. 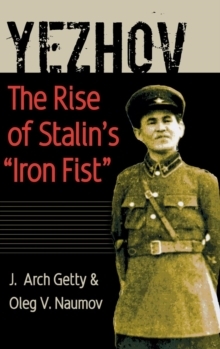 This book, based upon unprecedented access to Communist Party archives and Yezhov's personal archives, looks into the life and career of the enigmatic man who administered Stalin's Great Terror. J. Arch Getty and Oleg V. Naumov seek to answer a series of troubling questions. What kind of person calmly and efficiently sends thousands of innocent people to their deaths? What could prepare a man for such a role? How could a person whom acquaintances describe as friendly, pleasant, and even gallant carry out one of history's most horrifying campaigns of terror? The authors uncover the full details of Yezhov's rise to power and conclude that he was not merely Stalin's tool but a skillful maneuverer in his own right. The historical documents provide a thorough portrait of Yezhov and reveal a man of fanatical dedication to his leader and his party-a man who became a willing murderer. Readers will find his story chilling, the more so in our own times, when the impulse to terror that engulfed Yezhov seems neither surprising nor unfamiliar.